I agonised about this trip. With only a few weeks to go before we depart for the Twin Cities and then only a few more days before the caravanserai of the Mississippi Million leaves for Lake Itasca, I was weighing up whether or not to go on a five day trip to the headwaters with Graeme Mulcahy (one of the heroes of the project, about whom more in a further blog). As it turned out, not only was the trip incredibly valuable, it would have been remiss not to go. We flew on Delta Airlines via Chicago, with the usual O’Hare delays and benchmark sullen border security (it was our misfortune to arrive immediately prior to two 747′s from Korea with marvellously cheerful Koreans, brandishing passports the size of telephone directories. They were met with border guards, untroubled by sense of humour, who insisted on examining every page….). We made it to the Twin Cities, were met by Dan Adams (aka, the nicest man in the world. In case you are in any doubt, ask my best man, the second nicest man in the world, who will verify). We then drove to Lake Bemidji, which we used as our base. For two long days we scouted the river from source, checking ingress and egress points, campsites and micro-breweries – Graeme is a devotee, I am a model of self-denial…… We immediately realised that our calculations on when and for how long we would need to use the canoes before we could use the skiffs were wrong, together with the practicality of some of the campsites. All this has an impact on the already serious logistics, especially for the participants and their travel plans. Whilst this info was extremely useful, it was but nothing compared to seeing the Mississippi just now. The upper mid-west has had biblical rainfall – the wettest June for 100 years – and consequently the river is in full spate. 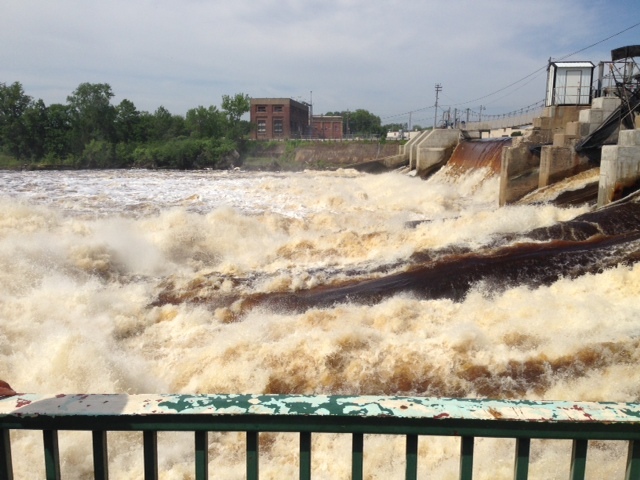 At the Twin Cities, site of the first of the of 29 locks, the river at this time of year flows at approximately 1-2 knots. When we were there, it was estimated at 11 knots…. 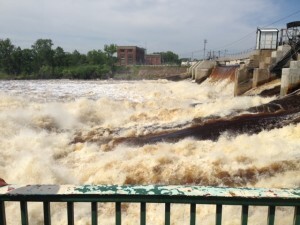 (video of the St Anthony Falls here St. Anthony Falls ). We are assured that the river is falling, a comfort as it is currently un-navigable even by heavy commercial traffic. We have a few short weeks to hope it reverts towards the norm. Although the trip down will be a little faster, the dangers of the river are increased exponentially. Any images of drifting down, enjoying a cooling glass and admiring the scenery have been quickly banished. This has become a serious challenge on a serious river…..